After suffering a 5-2 loss in an atrocious game in New Jersey (which I apologize for not recaping, things and responsibilities got in the way) the Flyers returned home to Philadelphia to get a rematch against the Devils. They didn’t start off much better than in the last game, getting outshot and outplayed early on. They also got themselves into trouble when towards the end of their own power play Voracek and Simmonds were penalized for hooking and roughing respectively at 10:34 which gave the Devils a 4 on 3 power play, quickly turning into a lengthy 5 on 3. Fortunately the Flyers were able to kill it off. At 15:21 they also got a bit lucky when Read passed the puck to Gagne who skated with it into the Devils zone and as the two NJ defensmen collided in front of him he got plenty of time to pass the puck to Talbot who put it in the net from a side of the goal, 1-0 Flyers. The Devils managed to tie the game though at 06:09 in the second period when Clarkson deflected the puck behind Bryzgalov‘s back. No other scoring followed in the regulation, though both teams had their chances and good looking moments. The game went into overtime which didn’t see any scoring either. The game had to be decided in the shootout, which historically doesn’t bound well with the Flyers. They were able to win that one though when Read and Giroux scored, while it was only Kovalchuk for the Devils who got the puck behind Bryzgalov. The Flyers won 2-1 in the shootout. Last night was a special night. If not for everybody then for Gagne fans in Philadelphia and Simon himself for sure. Last night’s game against the Washington Capitals was his first in the Flyers uniform since 2010. Getting traded from LA on Tuesday he still made it to Philadelphia on time to take part in the game against the Caps. The Flyers started off really well scoring only 23 seconds into the game from a stick of Giroux. They made it 2-0 when Wayne Simmonds found the back of the net at 4:04 of the first. 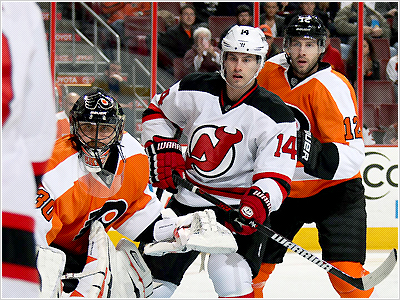 The Flyers showed a great effort, which showed especially in the 2nd period when they outshot the Capitals 12-3. The Wells Fargo Center exploded in great cheers when none other than Simon Gagne scored on a power play to make it 3-0 Flyers at 3:54 of the second period. 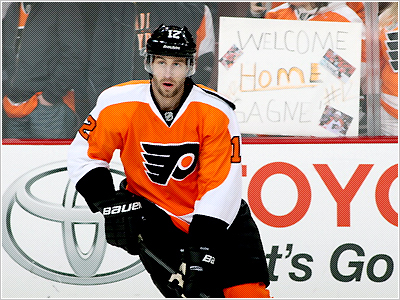 The Flyers then added another goal when Max Talbot scored his first of the season. The Caps only managed to prevent Bryzgalov from getting a shutout when they made it 4-1 at 17:51 of the third, which was also the final score. Simon played like he never left Philadelphia. He was fast and great on both ends of the ice. He played on a line alongside Sean Couturier and Max Talbot. He also saw some power play time on the 2nd PP unit and he used it as a chance to score his first goal of the season. The crowd in Philadelphia gave him a great welcome – cheers during warm-ups and also short tribute video of him that sparkled a standing ovation for Gagne. And Simon gave back by providing one of his best performances of the season. He had 4 shots on goal, 2 hits, he was even in +/- rating and scored on a power play. Full game recaps and video links after the jump! Chance for you to meet Simon! I would like to also apologize for not posting any recaps of the last two games. I was incredibly busy and couldn’t afford staying up late for the games, also Simon was scratched for both of them. Here I’m at least bringing you links to game recaps of the last night’s game against the Calgary Flames which the Kings won 3-1. The Kings didn’t play that well yesterday in Chicago, at least not for full 60 minutes. They started off slow and you can’t do that when you’re facing a team that hasn’t lost in regulation since the start of the season. The Blackhawks quickly took a lead with a goal from Brent Seabrook at 6:29 of the first period. 4 minutes later they added a power play goal from a stick of Jonathan Toews. The second period wasn’t any better as the Blackhawks outshot the Kings 21-10 and took a 3-0 lead only 56 second into the period. 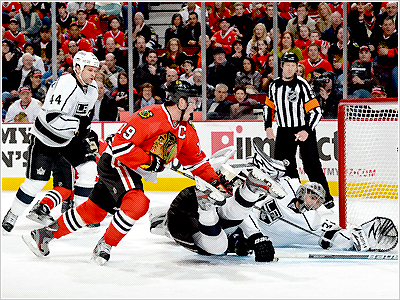 In the third period the Kings picked up their game a bit, limiting Chicago to only 5 shots in the period. They also added couple of goals, both scored by Mike Richards, both on power play. But it was all too little, too late. Even with Oduya taking a (not very smart) penalty with only 1:04 left in the third, thus negating the empty netter that otherwise would’ve counted, and with an advantage of 6 skaters against 4, the Kings couldn’t find a way to tie the game. The final score 3-2 Chicago. Simon didn’t have that great of a game either, much like the most of the team. Even though he wasn’t on the ice for any of the Chicago goals, he wasn’t on the ice for anything on the other side either. He had 2 shots on net, one of his shots was blocked and he also blocked one shot. He started on the first line but following the two goals from Chicago coach Sutter started a shuffling game. Towards the end Gagne saw the most time on a line with Williams and Stoll. In today’s practice he’s even skating on a 4th line with Fraser, Lewis and Nolan. It might also happen Sutter will bench him for the upcoming game in Edmonton. We have to wait and see. Following their 5 game road trip (from which they brought only 4 points) the Kings had three days off before returning to their home ice. Last night they faced off against the Columbus Blue Jackets and for sure wanted to repeat the result from last time the teams met (Kings won 4-2 in Columbus). They also wanted to follow up on their win against the St. Louis Blues who they beat 4-1. The fans almost saw scoreless two first periods hadn’t it been for Kyle Clifford who picked up the puck on the Kings blue line and created a 2 on 1 opportunity with Lewis on the other side. 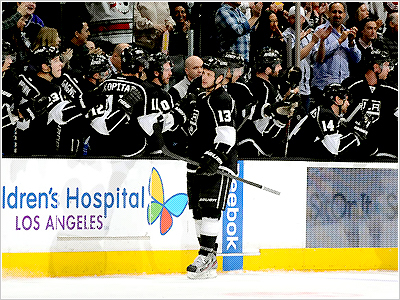 He decided to shoot though and scored, making it 1-0 Kings at 18:40 of the second period. Only 49 seconds into the third period the Kings went on a power play (their 4th of the night) and finally managed to score. Mike Richards made it 2-0. With 2:25 left in the third the Blue Jackets dramatized the ending when they got on board with a goal from Nick Foligno. That was it for the scoring though and Kings won 2-1. What deserves pointing out is Kings defense, they eliminated the Jackets to only 13 shots and also Bernier who started in net in favor of Quick again and was really solid. Simon seems to be picking up his performance game by game but he’s still scoreless. If he keeps playing the way he is though, he sure will see his game on the scoreboard soon. He may have had only 1 shot on net (and one missed shot) last night but according to Robert from JftC Gagne was one of the most effective forwards (along with Penner) at driving play. Entered the zone with control of the puck 7 times for 7 shots through.